MINNEAPOLIS, MN, UNITED STATES , October 15, 2018 /EINPresswire.com/ — The Mars Generation announced today that their founder Abigail Harrison, a dual astrobiology and Russian major at Wellesley College and aspiring astronaut, has been named a TIAA Difference Maker 100 Honoree for her work raising awareness worldwide about the importance of space travel and science, technology, engineering, arts and math (STEAM). In celebration of TIAA’s 100th year of serving those who serve others, TIAA is recognizing 100 people, like Harrison, who work for a nonprofit and are making significant contributions in their community or the world. TIAA, the leading provider of financial services in the academic, research, medical, cultural and government fields, is awarding each Difference Maker 100 Honoree with a $10,000 donation (giving away a total of $1 million dollars) to support the nonprofit organization through which they make a difference. Harrison’s award will go to support The Mars Generation. 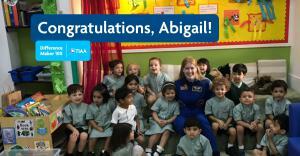 Harrison, more popularly known as Astronaut Abby, has built a community of support around the globe and leveraged her outreach program to establish a nonprofit – The Mars Generation in 2015. The Mars Generation’s goal is to energize others around space and STEM/STEAM and to educate young people and adults about the importance of human space exploration. The organization’s Student Space Ambassador Program mentors teens and young adults to share their excitement about space exploration in their own communities and provides full-paid scholarships for students needing financial assistance to attend space camp. TIAA is recognizing 100 Difference Makers to mark its centennial and to celebrate those who have dedicated their lives to serving others. For more information about Harrison and TIAA Difference Maker 100 program, please visit TIAADifferenceMaker100.org.